Housed in a beautifully restored 1915 log home, the Minturn Inn is a charming bed and breakfast inn with breathtaking views of the Rocky Mountains. Nestled between the famous ski resorts of Beaver Creek and Vail, the historic homestead rests on the main street of the town and is within walking distance of all its attractions. The log cabin-style inn features nine stylishly appointed and traditionally decorated rustic-chic guest rooms with private bathrooms, river rock fireplaces, and balconies with spectacular views. The lodge has a deep wraparound porch with outdoor seating where guests can relax with a book, a comfortably furnished living room with a stone fireplace and plush armchairs, a fully equipped exercise room, and a sunny dining room where a complimentary hot breakfast is served every morning. 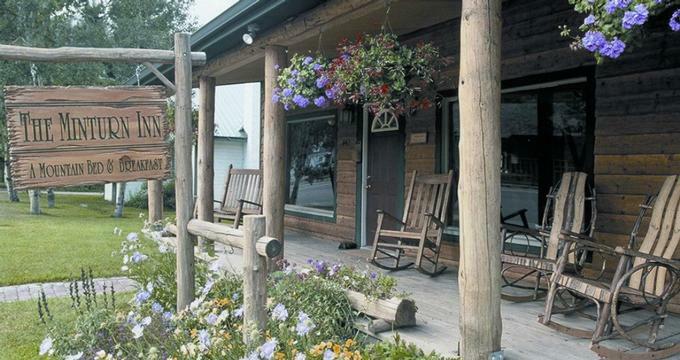 The Minturn Inn features nine stylishly appointed and traditionally decorated rustic-chic guest rooms with beautiful view of the gardens and the Rocky Mountains in the background. Six of the guest rooms are located in the front section of the house, which dates back a century, while the remaining three bedrooms are found in the new addition to the Inn. While guest rooms differ in layout and size, all are decorated in a rustic chic style with log furnishings and historical memorabilia and have king or queen-size pillow-top beds dressed in high-quality linens, hypoallergenic comforters, and pillows, and en-suite or private bathrooms with shower/bath combinations, make-up mirrors, plush towels, and organic bath products. Some rooms have sitting areas with chairs and wood-burning fireplaces, and modern in-room conveniences include flat-screen televisions with cable channels and complimentary wireless Internet. A complimentary European-style buffet breakfast is served each morning and includes freshly brewed coffee and tea, fruit juices, fresh seasonal fruit, egg dishes, Italian meats and cheeses, and daily selections such as croissants, blueberry muffins, homemade granola and Greek yogurt, and an assortment of fresh bread. The Minturn Inn features amenities and facilities such as a broad wraparound porch with outdoor seating where guests can relax with a book, a comfortably furnished living room with a stone fireplace and plush armchairs, a fully equipped exercise room, and a sunny dining room where a complimentary hot breakfast is served every morning. Minturn offers an array of things to see and do, from arts and cultural attractions to outdoor and recreational pursuits. Cultural buffs can visit the May Gallery, the Colorado Ski & Snowboard Museum, the Walking Mountains Science Center, the Frisco Historic Park & Museum, and the Dillon Schoolhouse Museum. Other interesting places to visit include the Lomax Placer Mine, the Red, White, and Blue Fire Museum, the Edwin Carter Discovery Center, the Mountain Top Children’s Museum, the Summit Ski Exhibit, the William Briggle House Museum, the Breckenridge Sawmill Museum,High Line Railroad Park, and the Washington Gold & Silver Mine. Outdoor activities and recreational pursuits include the Adventure Ridge Amusement Park, The Dobson Ice Arena,Beaver Creek Miniature Golf, The Children's Museum at Beaver Creek, the Vail Nature Center, the Vail Nordic Center, the Beaver Creek Resort, and the Avon Recreation Center.